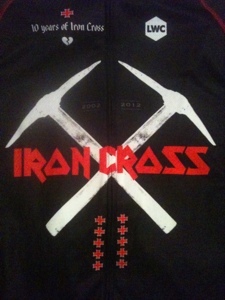 There is much debate about what constitutes a “monstercross” bike. What most can agree on is this is a fun and fast growing segment of the bike world. I thought it would be a fun and helpful exercise to gather a list of such bikes. It’s fun for me because it’s like electronic window shopping. I work as a Data Governance Analyst for a large worldwide financial services company. In my daily job activities, I see everyday that trying to get everyone to agree on a definition of even elemental items can be like roping the wind, or getting oil from a water spout <edit: with nat gas fracking, the latter actually is possible, so bad analogy>. 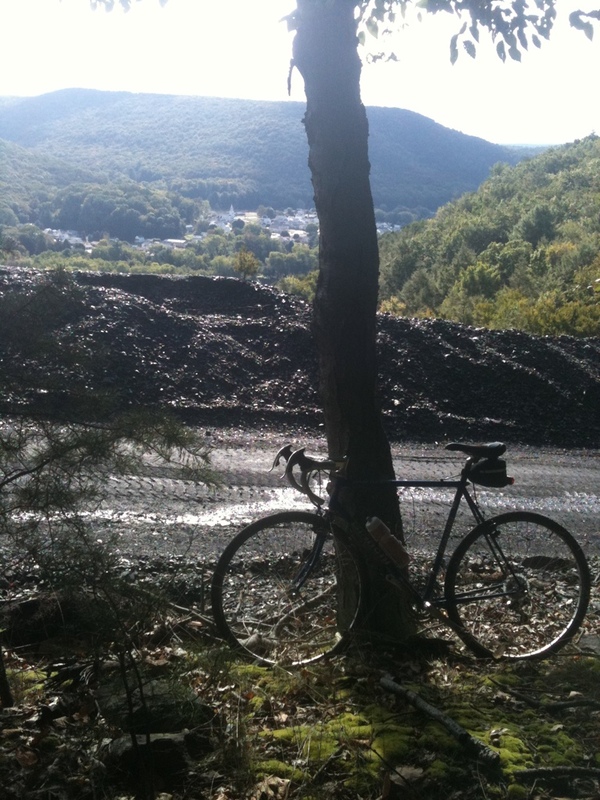 For the purpose of this post, I am defining my population of bikes as between $1000 and $2000 in cost, can fit large tires, drop bars, and disc brakes. 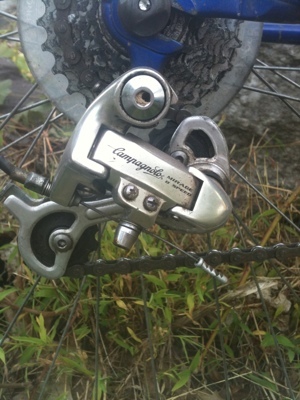 I know disc brakes are entirely not necessary to either to be defined as a monstercross bike, or to function as one; however, this criterion allows me to narrow down the population to a more manageable number. If there is a 3 dimensional continuum of bike genre, these bikes are somewhere where commuter, tourer, cyclocross, and road bikes overlap. Just as a congressman leans left or right, many of these bikes lean towards one genre harder than another. 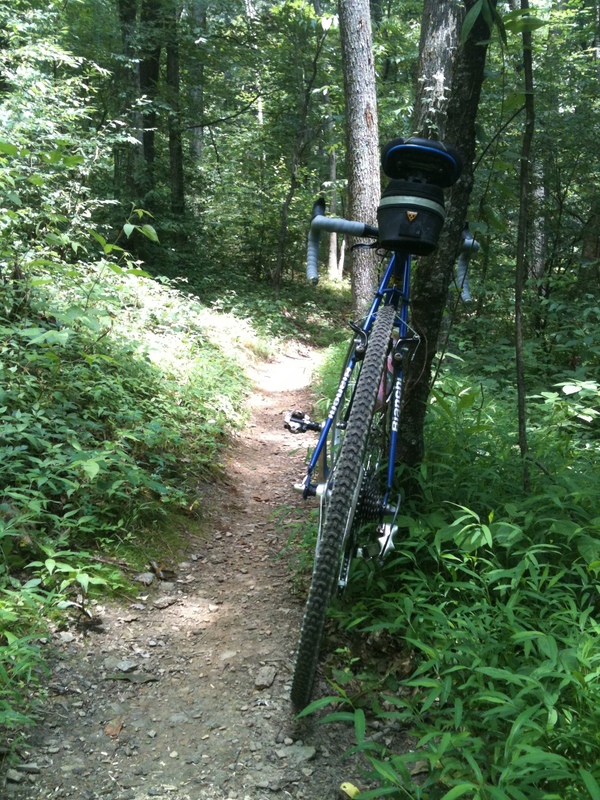 This is precisely where the beauty of this type of bike lies; they are at home on a B group road ride, or on smooth singletrack. Which bike is right for you? That would depend on where on the multidimensional continuum you lie as a rider. I am sure there are those who will disagree with my list, or cry about an omission. Please remember, I am not a professional bike journalist who gets to travel expenses paid to product launches or gets faxed press releases! The table below list the bike manufacturer and model name, frame material, and a link to either brand website, or review. I also included a short and subjective description. Noticeably absent are some good entry level bikes like the Focus Mares AX 2.0 Disc, Felt F65X, etc. I decided to leave them off the table above since they are cyclocross racing centric. However, any of those would also make a great gravel grinding type of bike suitable for races such as R2D2, Iron Cross, etc. so are included below. Also absent were the offering from BikesDirect.com. I don’t personally have an issue with this company, but I think buying in this method is different enough to exclude the Motobecanes and Gravitys they offer. 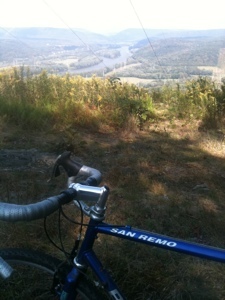 I won’t be partaking in the melange of gravel, singletrack, roads, and run ups this year. However, for those folks who are thinking about racing this event and are looking for more information, I am reposting a list of links I put together last year, along with adding some others. Hopefully you will be motivated by these historical posts to enter the foray that is IC XI. 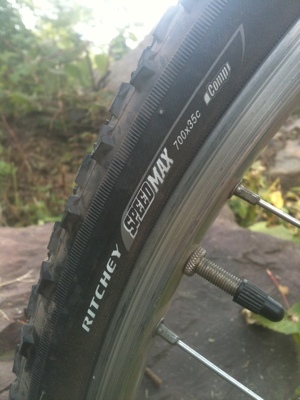 Hill Junkie Blog – CX or 29er? 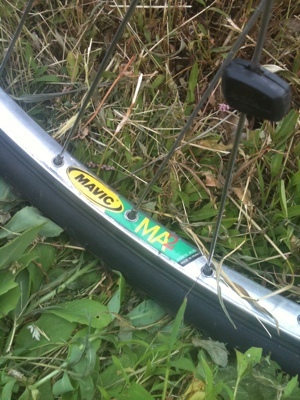 Mavic 36 spoke MA-2’s wrapped in…. 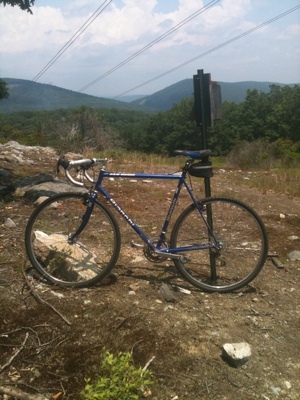 I bought this bike as my first “road bike” after riding a mountain bike on the road. 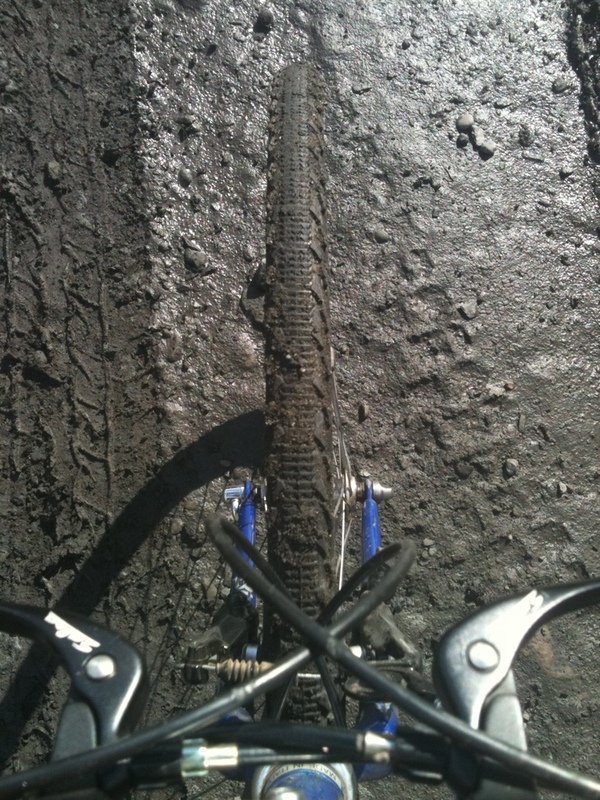 Coming from a mountain bike, this pig felt light! 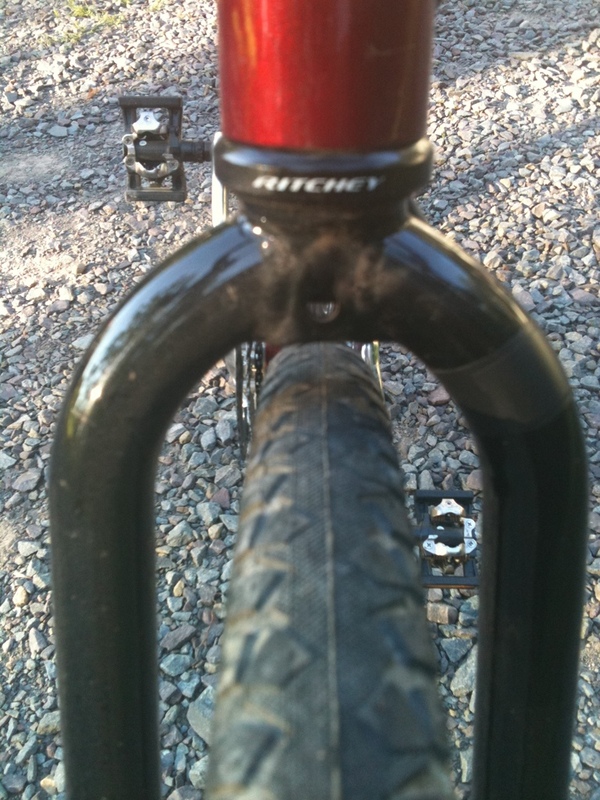 Technically, it’s a touring frame, buy there isn’t too much difference in geometry between cross and touring bikes. 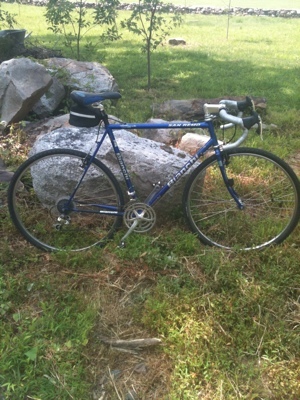 I rode it for awhile, including a tri or two until the opportunity came up to buy an aluminum tri specific bike. 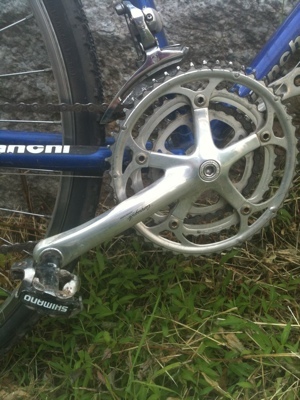 This was an enlightenment in bike frame material technology and I realized this frame was in fact not light. 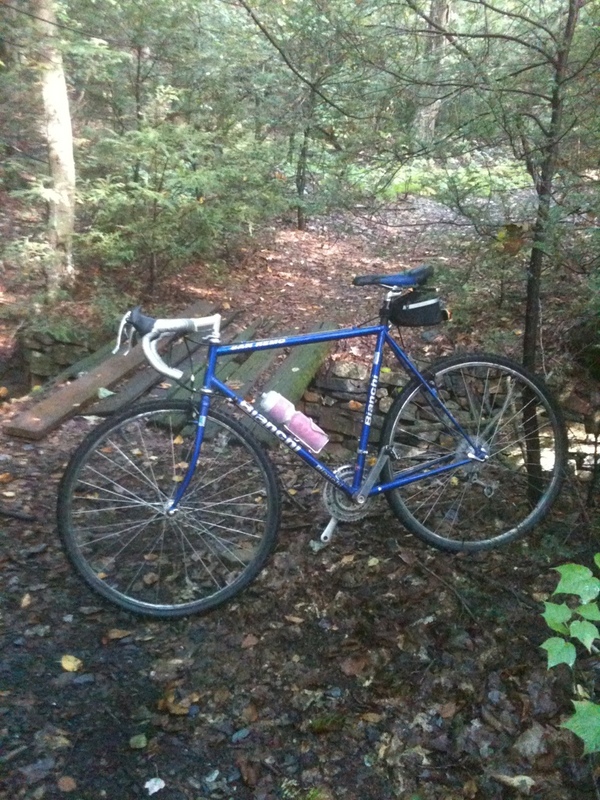 The bike was parked for awhile as I acquired a aluminum Bianchi Giro as a daily driver. 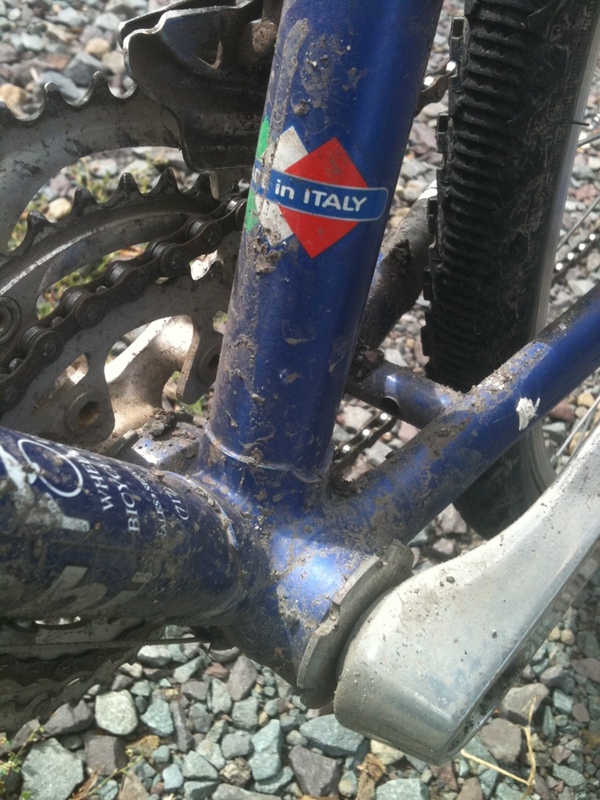 When the opportunity came to try cross, I dusted off the old Bianchi and threw some knobbies on ‘er. She was also pressed into service to carry the baby seat. 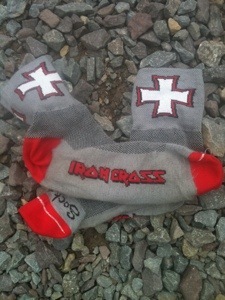 She again got a new lease on life when I signed up for 2012 Iron Cross. 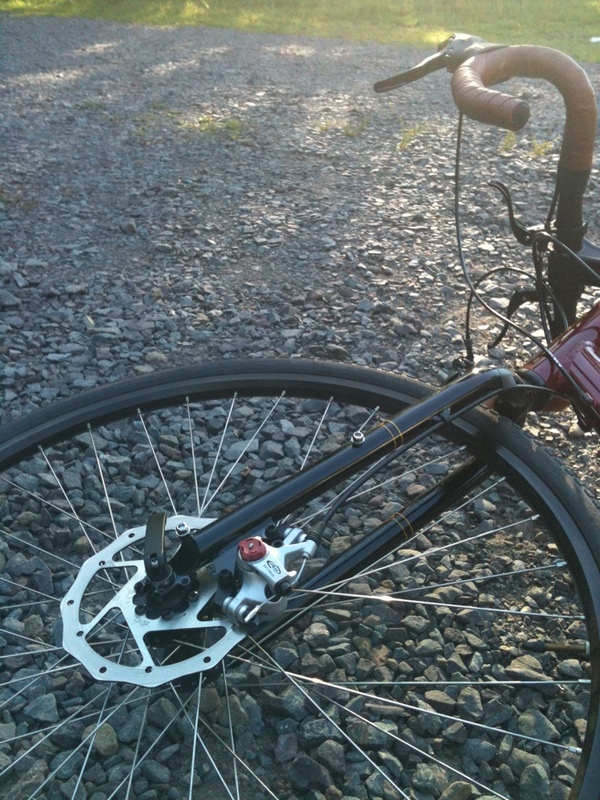 I added the mini-v brake up front to reduce fork chatter. 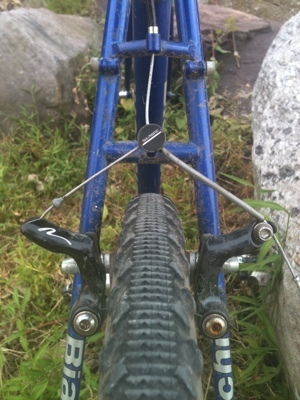 Also added the in line levers for shifting weight back on descents. 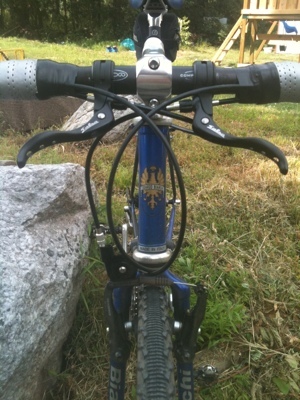 I also changed out handle bars from a Cannondale and seat post from a Trek mountain bike. 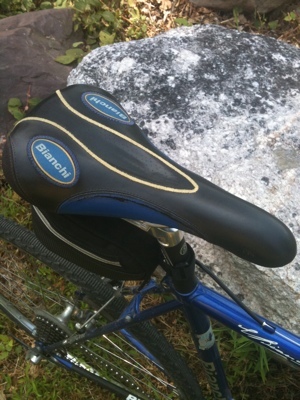 The seat is from my Bianchi road bike–too plush for the road but great for cross–also matches frame color! Switched out to a shorter quill stem purchased from eBay.